I’ll summarize as best I can for now. HMS Hood was designed and built too late for WWI and was Jackie Fisher’s ultimate battlecruiser. She had the punch pf a battleship with 15-inch guns and the speed of a cruiser. Unfortunately, she lacked armor protection. For 20 years, she was the symbol of British naval power showing the flag around the world. At the start of WWII, she was denied certain upgrades to bring her up to modern standards but was pressed into service due to the needs of the country. In May 1941, she met the Bismarck in the Denmark Strait and was lost in one of the few big ship vs. ship gun duels. Her lack of armor caused a shell to penetrate her magazine and the resulting explosion destroyed her with only 3 survivors out of 1,400. Hood was a strikingly handsome ship and it has fascinated naval history students for decades. 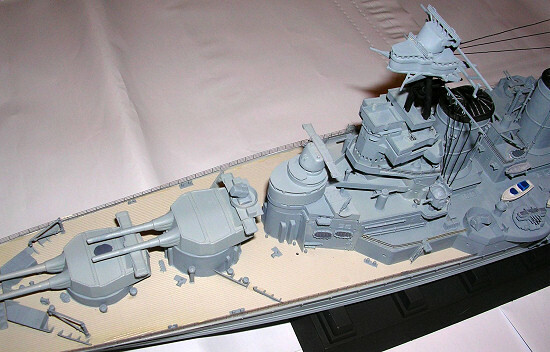 Trumpeter answered the call of ship modelers with the first 1/350 scale plastic model of this famous warship. The only other models in 1/350 scale previously were beautiful, short run, resin kits costing a small fortune. Trumpeter has shown a steady progression and improvement curve in their 1/350 ship line. Hood is thoughtfully engineered and looks great in the box. 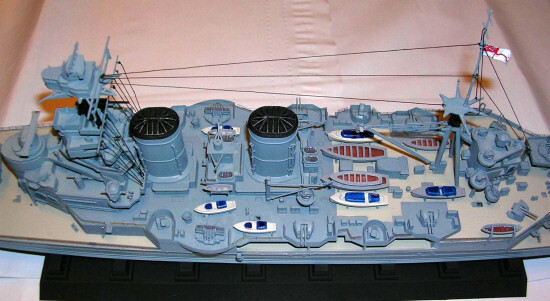 You get full hull or waterline option, a small fret of phototetched brass with some ladders, crane, and radar details. Flag decals, a color drawing and customary well-done instruction book round out the package. The model is presented as the ship appeared at the time of her loss in May 1941. Modelers wishing to portray Hood in her previous iterations will have some work ahead of them. See the HMS Hood Association website for amazing photos and a detailed painting guide that is indispensable for any modeler doing this ship. You can certainly tell that Trumpeter is learning and listening to modelers. One of the first things I look at with any ship model is: where are the deck seams going to be? Trumpeter cleverly hides the forward deck seam under the breakwater shield- very nicely done! Everything else is laid out with ease of construction and painting in mind. All superstructure side detail is added onto block structures- meaning you can paint all these pieces before assembly and touch up later. It also allows you to paint the deck more easily with less masking. I went off the sheet for construction sequence beginning with the main gun turrets. I purchased the Trumpeter brass barrel set off ebay and they attach to the turret faces easily because the barrels are molded in styrene blast bags! Another nice touch allowing you to not need CA glue and to not have to fashion blast bags on your own! 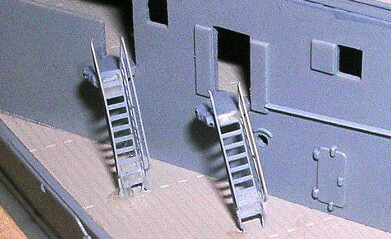 PE ladders were added to the rear of each turret. Next I sprayed the deck pieces with Tamiya Deck Tan. For the main hull color, I used Testors Model Master FS 35237 Medium Grey which is a very good match for Royal Navy AP507B- it’s a bluish grey. After spraying the one-piece hull and the superstructure pieces while on the sprue, I attached the deck pieces into the hull. Some elastics were needed around the hull to keep everything tight- but that’s all that was required. When dry, assembly continues without a hitch. The horizontal hull details are added and all fit quite well. 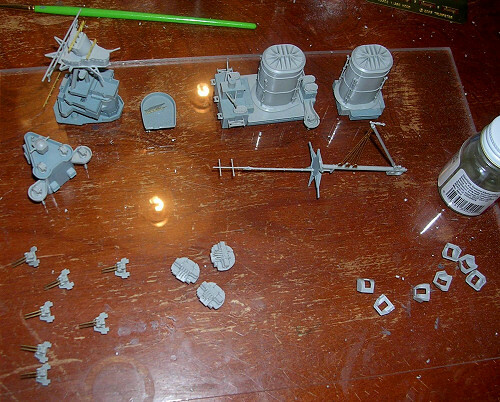 Once those were attached- a considerable amount of time is taken with adding all the various doodads around the deck. These include bitts, ready use ammo lockers, vents, etc. Even the fiddly areas went together very easily- the fighting top and aft mast tripod looked scary at first but the parts fit solidly and aligned very easily. While I did not use a PE set specially designed for the kit- I did use PE extensively by raiding my stash of 1/350 PE leftover from past models. All inclined ladders were replaced with PE and of course railing was added around the ship. I must say everything went together with no hassles- all sub assemblies were attached to the deck after painting with no trouble. Last steps were the ships boats and rigging. I used black line from my sailing ship pile of rigging. Finally, the flag was attached with a small piece of aluminum foil sandwiched in between. This is a great tip that not only adds strength to the decal but also allows you to shape it nicely for wind effects. Rather simple in basic form: 35237 overall, deck tan for the teak wood, black funnel caps. 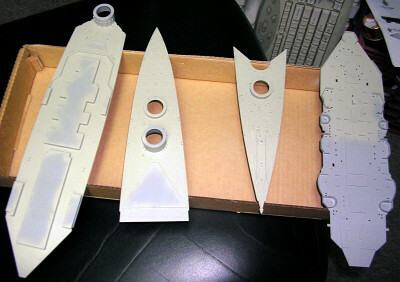 Again, the Hood Association site was very helpful in minor details of painting like for the ship’s boats and cutters. I tried a little drybrushing with dark ghost grey - it looks Ok in some areas but in others I guess my technique is just not that good! I have built just about all of Trumpeter’s 1/350 line of ships and the Hood is one of if not the best one so far. Thoughtfully engineered, very easy to build and significantly detailed throughout make it stunning out of the box for almost any modeler. In terms of accuracy, all reports so far seem to say it is very highly accurate. Hood was a symbol of Britain’s naval supremacy that met a tragic end in one of WWII’s most dramatic episodes. This model will sit beside my Tamiya Bismarck ready to tell a story should anyone ask about these famous ships.